Okamiden is a game about children, the children of the main characters of 2006's surprise hit Okami. But will the DS title be a game for children when it hits the U.S. next year? Okamiden producer Motohide Eshiro doesn't seem to think so. Instead, he sees it as a true successor to the Playstation 2's (and later Wii's) Okami. 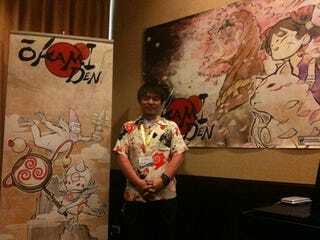 "The team working on Okamiden are highly confident of their ability to create the work of Okami on the DS," Eshiro told a gathering of games press last week. Okamiden takes place a few months after the events of Okami, with players taking on the role of Chibiterasu, the cub of sun-god-turned-wolf Amatersau. Because he doesn't have the full power of his parent, Chibiterasu will wander through the game with different partners including Kuni, the son of the original game's Susano. "They will have to work together and that will make them stronger as a team," Eshiro said. The game will feature a number of new settings and some pulled from the original title, though those original settings have changed with time, he added. As with Okami, Okamiden will rely heavily on the use of a celestial brush to interact with enemies, characters and the backdrop of the game. That's one of the reasons, Eshiro said, that the developers decided to make the game for the DS. "We wanted to utilize the full potential of the DS," he said. "When you are using the celestial brush techniques in the game with a stylus it will feel more natural." Okamiden also features an improved brush mechanic. One new skill in the game called Guidance allows you to paint a line on the screen that Chibiterasu will then follow. Eshiro demonstrated this by having Kuni hop off of Chibiterasu with a button push and then walk along a line that he had drawn on the screen. The character, Eshiro pointed out, followed perfectly the curved line he drew. The game will also have new ways to fight, something that Eshiro said was problematic for some people in the original game. "We decided to streamline the fighting mechanic," he said. "You just have one button and you will still be able to use the celestial brush to fight, like with power slashes." On screen, Eshiro pointed out how some enemies have weak points highlighted with a red dot that can be attacked with the brush. This time around, the game will also have more colorful enemies, many inspired by Japanese mythology and legends. Some of the original game's enemies were also redesigned for the DS. The first boss battle of the game is against Master Anura, for instance, a giant frog. And some of these battles will include puzzle elements. Currently, Eshiro and his team have no plans to expand the game beyond the DS to other gaming platforms. The DS game is set to hit Japan later this year and "overseas" sometime in 2011.